Aurora has a personality of its own with a unique mix of flea markets, antiques, hardware stores, furniture, clothing, convenience stores, restaurants, video stores, florists, gifts, and more. Aurora citizens support a large number of events at the local saddle club and arena, including junior rodeos, mule rodeos, horse shows, and bull rides, as well as sponsoring trail rides and many other activities. Events such as Octoberfest, Apple Fest, and Erntfest, are all within a short drive and are held annually providing great food and entertainment. Off the beaten path and out of the ordinary is an Amish community which includes a bakery, cabinet shop, and quilting shop. The friendly yet shy Amish live much as they always have without many of the modern day conveniences. Stop in and get some fresh baked goods or view the hand made items available. This community is between Aurora and Mt. Vernon, off Hwy. 39 by turning left on P Hwy. toward the land fill. Aurora, the Summit City of the Ozarks, is within a short thirty minute drive to a variety of recreational facilities, most of which are state maintained. Fishermen enjoy the thousands of acres of fresh water lakes and the streams and creeks that boast some of the best trout fishing in the Midwest. Bass, Crappie, Catfish, and Spoonbill caught in the local lakes continue to be some of the largest in the state. Turkey, deer, quail, dove, and rabbit seasons are a small sample of those governed by the Missouri Conservation Department, providing a host of enjoyable opportunities for outdoorsmen and women. Trail rides and canoe rentals offer locals another way to explore the more than 5,000,000 acres of Mark Twain National Forest. Also being developed and completed in many areas are hiking, walking, and bicycling trails. Driving approximately one and half hours or less will take you in various directions to visit even more sites in Branson, where you can see live country music shows among other entertainment they provide, Carthage, the home of Precious Moments, Springfield, the 3rd largest city in the state of MO, or Eureka Springs which has tons of handmade gift items and art to view or purchase. December 20, 1840, Joseph Rinker, son of a captain on General George Washington's staff who participated in the surrender ceremonies at Yorktown, settled on a farm, a part of which is now in the city limits of Aurora. He built this house, Aurora's first, the following spring on land now occupied by Aurora Hospital. On May 9, 1870, a Congregational minister and former Union officer, Stephen G. Elliott and his wife, Anna, acknowledged the plat of a new town to be called Aurora, donating 40 acres of their farm. One day in November, 1885, was probably the single most important day in Aurora's first hundred years. On that day, workmen digging a well for Thomas D. Liles, a grandson of Rev. Samuel Liles who came to the township in 1843, ran into rock, set a charge of powder and blew up great chunks of pure galena ore. A company was formed to mine it; other discoveries followed one upon another. For a time it seemed as if shallow lead was to be found almost anywhere around Aurora. Word spread over the central states that in Aurora a poor man could get a 300 foot-square lease, dig down a few feet and find riches in the form of galena, dry-bone, or silicate. From everywhere they came, by train, on horseback or in a covered wagon, leased ground and set to work. The discovery of pure galena ore in the late 1800's was marked in Aurora's history by the coming of the railroad in 1872, lead and zinc in 1885, and the newspapers in 1899. The Gay 90's brought the good, the bad, and the ugly to Aurora. During this time there was prosperity, growth, and a flourishing town spirit. Pool halls, gambling halls, saloons, and men and women of "ill repute" were plying their trades. Fist fights were a common occurrence. Lumps or a black eye were considered enough to settle a quarrel. On the other hand, churches thrived and multiplied. Civic groups formed and held fairs, races, baseball games, and farmers' markets. Utility services became available and non-mining industries began to form in and around Aurora. The first large industry, Majestic Milling, came to Aurora in August, 1905. 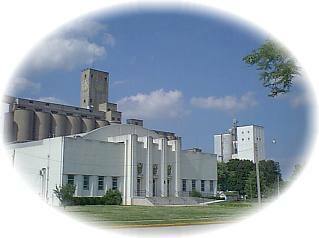 The MFA Milling Company expanded the operation into one of the largest feed mills in the world. The giant grain elevators stand today as a tribute to the historical significance of the mills operation and a welcome to visitors entering Aurora from the north along the Ozark Mountain Parkway, Highway 265. The Catholic Church was built in 1905 from bricks said to have come from Verona.